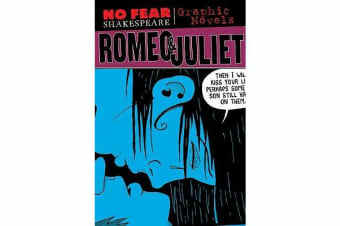 “No Fear Shakespeare Illustrated – Graphic Novels” is a series based on the translated texts of the plays found in “No Fear Shakespeare”. The original “No Fear” series made Shakespeare’s plays much easier to read, but these dynamic visual adaptations are impossible to put down. Each of the titles is illustrated in its own unique style, but all are distinctively offbeat, slightly funky, and appealing. Each book features an illustrated cast of characters, helpful plot summary, line-by-line translations of the play and illustrations that will enhance your understanding of the story and characters.